The 32 Short Colt was designed the late 1800s. Winchester sells 80 grain brass rounds for the 32 short Colt. The ballstic performance for the 80 grain bullet is 745 ft/s. The .32 Short Colt was designed off the .320 Bulldog revolver cartridge which was made during the 1870s in the United Kingdom. The .32 Short Colt had a different sized rim casing than the .320 Bulldog. The rounds were popular back at the turn of the 19th century for use in pocket revolvers. These could be carried inside the coat pocket for use as a accessible concealed firearm. The primer is a small pistol with a .61 inch case length. The revolvers for the .32 Short Colt are mostly out of circulation. The ones that can be picked up are generally used for collection purposes in museums or private collectors items. 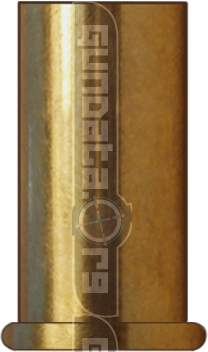 *Casing image above is an artist rendering and not a real photo of .32 Short Colt Ballistics cartridge. While we have went to great lengths to make sure that it's as accurate as possible this rendering should not be used to generate specs for casings.